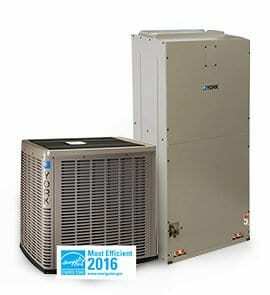 The YZH036 model is recognized as the Most Efficient of ENERGY STAR® 2016 when used with the Affinity™ Residential Communicating Control..
ENERGY STAR® qualifying efficiency rating of up to 18 SEER and 10.0 HSPF. Two-stage compressor offers a higher degree of performance. QuietDrive™ system provides one of the quietest units in the industry, allowing you to feel your comfort, not hear it. Automotive grade powder paint provides years of corrosion free performance.